Brad and Steve explore the double-edged sword of living a life driven by passion. Can one have passion and balance? When does passion turn into obsession? Great gift idea for young people headed to college or embarking on their careers. "Should we throw everything to the wind and follow our passions? Or should we strive for balance and let our passions cool? This book offers the surprising, nuanced, and research-backed answer." - Daniel H. Pink, Bestselling author of When and Drive. "I feel like this book was written for me. I had to resist underlining every sentence. "- Shalane Flanagan. New York City Marathon Champion, Four-Time Olympian, and New York Times bestselling author. The coauthors of the bestselling Peak Performance dive into the fascinating science behind passion, showing how it can lead to a rich and meaningful life while also illuminating the ways in which it is a double-edged sword. Here's how to cultivate a passion that will take you to great heights--while minimizing the risk of an equally great fall. Common advice is to find and follow your passion. A life of passion is a good life, or so we are told. But it's not that simple. Rarely is passion something that you just stumble upon, and the same drive that fuels breakthroughs--whether they're athletic, scientific, entrepreneurial, or artistic--can be every bit as destructive as it is productive. Yes, passion can be a wonderful gift, but only if you know how to channel it. If you're not careful, passion can become an awful curse, leading to endless seeking, suffering, and burnout. 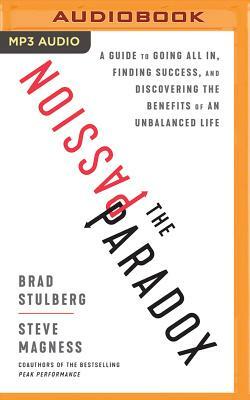 Brad Stulberg and Steve Magness once again team up, this time to demystify passion, showing readers how they can find and cultivate their passion, sustainably harness its power, and avoid its dangers. They ultimately argue that passion and balance--that other virtue touted by our culture--are incompatible, and that to find your passion, you must lose balance. And that's not always a bad thing. They show readers how to develop the right kind of passion, the kind that lets you achieve great things without ruining your life. Swift, compact, and powerful, this thought-provoking book combines captivating stories of extraordinarily passionate individuals with the latest science on the biological and psychological factors that give rise to--and every bit as important, sustain--passion.